9/20 Was An Inside Job! The black helicopters are circling the kennel. The Outfoxed gals have concocted another conspiracy, but it's based on a lie. With J$P Video! It's been way too long since we dipped into the cesspool of the Fox haters. What better time to see how things are progressing at the newshounds (another fine product of the Outfoxed cabal)? We've forgotten how entertaining a trip through the kennel can be. The hounds, as you know, are "media critics". They are ready to pounce on Fox for anything and everything, including the crime of misspelling someone's name. That just makes it funnier when the Einsteins rush to the defense of actress Sally Field, and get her name wrong no fewer than six times in the course of six paragraphs! If that's not enough of an embarrassment for the biased bassets, then one can turn to their latest outrage: "Fox Fails to Disclose Important Background Information" about a guest who opposed Iran's A-Jad speaking at Columbia. The guest was Carolyn Blashek, a Columbia donor and alum. The curs uncovered a blatant conflict of interest, a glittering example of journalistic fraud, fully worthy of their bold-type headline. Fox is hiding the fact that Ms Blashek founded Operation Gratitude, which sends care packages to US soldiers. Shocking! If you support the troops, that's a sign of bias to the Fox haters. Most revealing. But wait, there's more. Not only does she attend to the needs of US soldiers, there's an even darker secret that Fox failed to reveal: her husband is in the military. Scandal! Fraud! Yes, this is the egregious outrage that the mutts are so in a lather about. No, really. We couldn't make this stuff up. Melanie--you have your facts all wrong. My husband is not, nor has he ever been, in the Military. Neither have I, nor my siblings or children. I am as plain and old a Columbia alumni as there is. So did Melanie apologize, and rectify her fictitious post? Don't be silly; this is the newshounds were talking about. Instead, she snarked back: "I did not say or insinuate that you, any of your siblings, or any of your children have been in the military." And Mel's shocking, but untrue, revelation about a nonexistent husband in the military remains uncorrected as of the time of this publication. 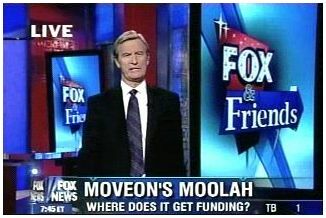 Today they had Byron York, Fox News Correspondant [sic] on to discuss where MoveOn.Org gets their money. Oh, Donna also goes on to register the ludicrous complaint that when Fox showed the tasered student video, it was "with Kerry's name mentioned of course". Yeah, they should've mentioned Chester Arthur or Donald Trump instead. Incredibly, this drivel is what passes for insights among the Fox haters. Bush denounced the MoveOn ad (headline) at an infrequent press conference yesterday, after being asked about it by FOX correspondent Wendell Goler. It is not imagination that the presser was called specifically to set up that question and answer. That's not Wendell Goler. That's the voice of Bill Sammon, a print reporter for the Washington Examiner. That won't do. Chrish's mysterious machinations between Fox and The White House won't work unless a Fox reporter asked that question. So, she lied, and said it was Mr Goler. Despite the fact that anyone who checked her "facts" would catch her fabrication in an instant. It's not that much of a risk inside the noise machine: the Fox haters swallow anything the echo chamber feeds them. Even lies. Well done, as always, J$. Let me get this straight. First it was Fox getting their talking points from Bush. Now it's Bush getting his talking points from Fox. When will they make up their minds about which lie we're supposed to believe? Uh? What's your point? A lot of work for nothing really. Johnny I love the 'Racket Squad' music. You are the modern day Capt. John Braddock of the Racket & Bunko Squad! Back then they stole money. Example: Nelson, poor man, never knew they sucked his brain clean! Puck, you have dated yourself by recognizing that music! Yes, the newspooches have quite a racket going on! This has to be the most pathetic attempt at a rebuttal I've ever read on a blog. Let me get this straight, Johnny, you're basically admitting Fox is biased, because they bring on partisan hacks like Byron York and openly attack MoveOn, and yet you claim NewsHounds shouldn't be taken seriously because, quote, "they spelled her name wrong", and they misidentified Byron York as a Fox News Correspondent? Misidentifying York as a Fox News Correspondent actually helps their argument, not yours. York is a partisan Republican who works for the Weekly Standard, a Republican publication, and he was brought on without a Democratic or liberal counterpart. Additionally, Ducey and Kilmeade were openly ripping Democrats throughout the last two weeks over the MoveOn.Org ad. Would you care to post videos of the full interviews they gave discussing the MoveOn controversy? By the way, Johnny, you look pretty foolish spitting out the "Fox is fair!" line when your own ideological compatriots basically openly admit that Fox News is running propaganda for them. 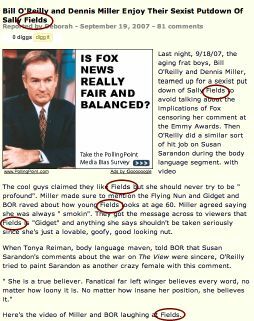 Take RightWingNews, they list Fox's own website as the most popular "right of center" site on the net. If you can't convince other conservatives that Fox is balanced, it would be like a liberal who can't convince other liberals that the NYT isn't really liberal. I.e., it's pathetic. Seriously, if you want to help Fox run propaganda, that's one thing, but if you're going to sit here and try to claim that a news channel run by a former paid political consultant of Rudy Guiliani is fair and balanced, no one is going to take you seriously. How about newshounds shouldn't be taken seriously because they lied about Wendell Goler to concoct a phony conspiracy theory. Most conspiracy theories are unreliable. Those built on a lie always are. That, and the 200+ other falsehoods that they've been caught in pretty much make the case that anyone who regards the newsmutts as anything other than propagandizing liars has some serious mental issues. a news channel run by a former paid political consultant of Rudy Guiliani is fair and balanced, no one is going to take you seriously. Is that the same news network whose OWNER contributed $60,000 to Hillary Clinton? 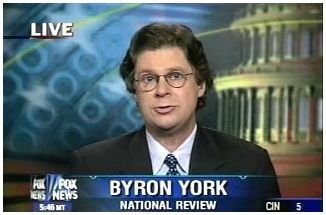 Byron York works for National Review, by the way (not the Weekly Standard).